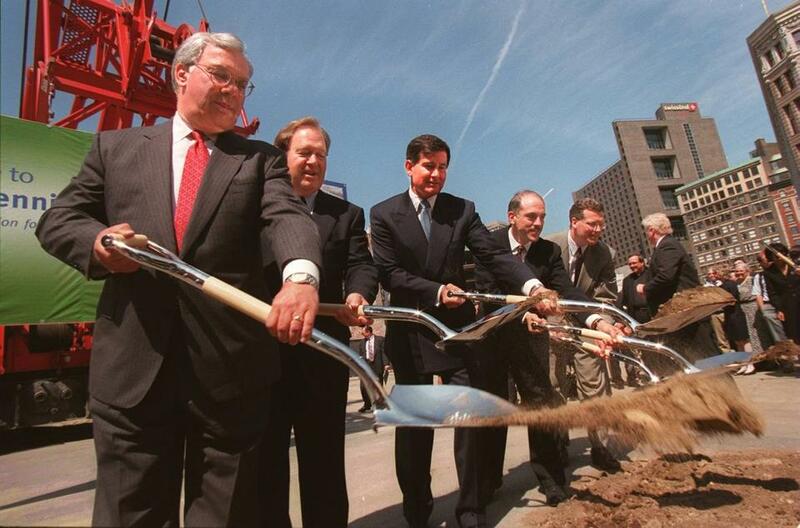 Tom Menino, the shovel-ready mayor. Tom Menino’s driver shifted his SUV into park, and Boston’s longest-serving mayor gazed over piles of partially frozen soil. Menino had just broken ground on 310 apartments in the Bulfinch Triangle, and as his vehicle idled on the construction site, the mayor tried to conjure up what the neighborhood had looked like when he’d taken office 20 years ago. Where Menino paused, where scores of apartments are now springing up, cars had once rumbled overhead, along the old elevated Central Artery. Back then, he recalled, the highway had made the surrounding neighborhood dark, unwelcoming, and mostly lifeless. Now it was anything but that. Blocks to the mayor’s right, contractors were turning a decrepit old wharf into a new headquarters complex for Converse. When he looked straight ahead, he saw the Government Center Garage, a massive structure that will soon be cut in half and redeveloped as residences, offices, and retail space. The Rose Kennedy Greenway unfolded at his left. The mayor couldn’t help but marvel at the difference that two decades had made. When Menino relinquishes control of City Hall next week, he will leave behind a city that is booming, and is thoroughly modern. But Menino’s development legacy isn’t just that he left Boston covered in his fingerprints. He reshaped Boston by focusing his energies on areas that define good cities: on vibrant neighborhoods and on downtown housing. Boston’s recent successes are not unique. Menino was an urban mayor at a time when Americans reembraced cities, and Menino’s successes were not his alone. Austin, Pittsburgh, Seattle, New York, and San Francisco have all enjoyed urban renaissances during the time Menino has occupied Boston City Hall. Cambridge and Somerville are both booming now, despite the fact that neither city calls Menino its mayor. The difference between Boston and Detroit is mostly due to the fact that the Boston region excels in health care, technology, and education at a time when the economy revolves around health care, technology, and education. As mayor of Boston, Menino had a strong hand to play. He made the most of it. Menino vanquished the Combat District and reclaimed Downtown Crossing by shaping the area as a modern urban neighborhood: It’s a destination for visitors, but it’s also a place Bostonians call home. Beginning with the Ritz Carlton condominium towers, which were built atop a scruffy parking lot facing the Boston Common, the mayor has used a parade of college dormitories and residential towers to push darkness and sleaze off Washington Street. Restored theaters and new bars and restaurants draw visitors to the neighborhood at night, but they only come because Menino seeded the area with permanent residents who keep the sidewalks from going dark. The 625-foot tall Filene’s tower, which began construction earlier this year, completes a transformation the Ritz towers began more than a decade ago: It will anchor a new residential cluster around what was once Boston’s busiest commercial corner. Menino used dense new residential neighborhoods to spearhead neighborhood transformations across the city. Menino rebuilt the Bulfinch Triangle and remade Boylston Street in the Fenway. He transformed the industrial Seaport. He urbanized standoffish urban renewal relics in the South End and around the Prudential Center. In Brighton Landing and Allston’s Barry’s Corner, he’s turning low-slung residential enclaves into mixed-use zones with tremendous growth potential. In all these cases, Menino curated a full-time city, a city of full-time residents rather than part-time commercial zones. While Menino wrote his signature all over Boston’s skyline, Boston’s success owes equally to the less tangible focus Menino gave to Boston’s neighborhoods. Successful cities celebrate the things that make them unique; it’s a strong sense of place that sets cities apart from sterile, chain-laden suburbs, and anchors vibrant urban neighborhoods. Menino fed this sense of place like no mayor before him. Menino was a relentless promoter of Boston’s small neighborhood retailers — the folks who set Boston apart from Billerica, or Jacksonville. From Adams Corner, Brighton Center, and Roslindale Village to Centre Street and Mission Hill, Menino celebrated what’s different about Boston’s neighborhoods. And community flourished around it.